Made a simple little pill model and wanted to use it in some kind of dynamics simulation so I made a couple other colors and threw it in a marble fountain. It turned out way better than I expected, honestly. 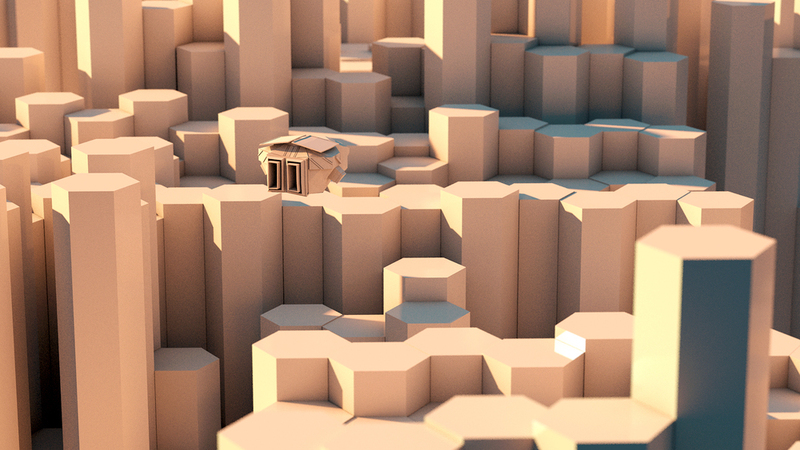 So this all started with trying to make a honeycomb pattern in Cinema by a lot of wrong ways. As it turns out, you need to simply reduce a cylinder to 6 segments and BAM, hexagonal, parametric column. So then I needed to clone them, and arranged them as close to a pattern as possible, which was simple. The problem (and subsequent time-sink) began when I decided I really wanted to have them randomly different heights to make an interesting composition. That took quite a long time and a lot of trial and error. The answer ended up being changing the 'multiple objects' factor in the random effector to x-20 or x*2 or whatever to make it change all the columns individually, which it previously refused to do. So yeah, that was cool. I threw the daylight rig on there and it started to look like an abandoned alien city or something so I tossed my little starship model in there. I like it, but I want it to be dirtier. Playing with lighting and clones and more low poly stuff.